Note: Numbers in this document with 'e' refer to exponents, for example, 2e-100 refers to 2 × 10-100. To run BLAST, PyMood BLAST Launcher uses FASTA files. They may have different types of extensions. The most common ones are: .fasta, .faa (fasta amino acid), .ffn (fasta functional nucleotide), .pep, .cds (coding DNA sequence), and .seq. Here we supply as an example the fowlpox.faa file. These are the text files, and can be opened in a text editor. Running BLAST comparisons on a desktop can take from a few minutes to many hours, depending on the size of FASTA files and the computer processor speed. For example, a comparison of 484 proteins of Mycoplasma genitalis against 689 proteins of Mycoplasma pneumonia takes less then a minute on a 1GHz processor. A comparison of 2267 proteins of Lactococcus lactis against 4279 proteins of Escherichia coli takes about 8 minutes, and comparison of the entire proteome of Arabidopsis thaliana vs. the entire proteome of human takes 18 hours on the same processor. These are the text files, and can be opened in a text editor. Each annotation file is a tab-delimited text file, consists of two columns and can be opened in a spreadsheet program or text editor. The first column contains the unique identifier for every gene, and the second column contains the gene name and/or annotation. Annotation in this file is extracted from the corresponding FASTA files. 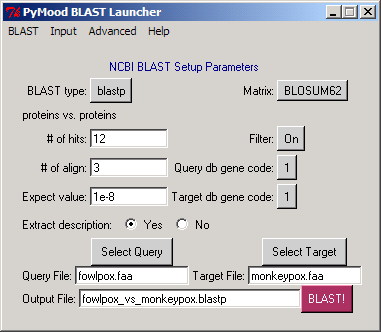 This annotation is extracted from the corresponding .blastp file and contains the annotation data for only those sequences from the target fasta file that are present in the BLAST output file. Each annotation file is a tab-delimited text file, consisting of two columns and can be opened in a spreadsheet program or text editor. The first column contains the unique identifier for every gene, and the second column contains the gene name and/or annotation. 1 normalized expectation value reflects the absolute value of the exponent in the expectation value. If the expectation value is 2e-15, the normalized expectation value is 15. For all expectation values better than e-100, like 3e-101, 7e-156, etc., the normalized expectation value 100 is assigned.